There is something truly magical about the rustic event space that is The Barn in Zionsville. This wonderful, warm and classic barn provides an ambiance unlike any other, and is the perfect place for your next private event. From the wood and landscape to the chandeliers, The Barn in Zionsville is the perfect backdrop for a wedding. It is extremely romantic, and is great for both the ceremony and the reception. 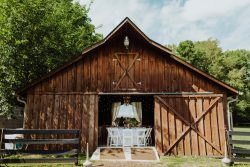 When you rent The Barn in Zionsville for your wedding, you’ll have access to the barn, three outdoor ceremony spaces, the bonfire pit, plenty of rustic decorations and more. Make sure to schedule a tour of the event space to see if The Barn in Zionsville is right for you. Their staff will be more than happy to show you around, and answer any questions that you may have. For a beautiful backdrop for your special day, book The Barn in Zionsville. Booking Howl2GO Dueling Pianos’ world class show to your Zionsville, IN event couldn’t be simpler. From conventions to corporate events, weddings to fundraisers, our unbeatable Dueling Piano shows bring a high energy, interactive show that your guests will remember for years to come anywhere inIndiana!